Be the first to share your favorite memory, photo or story of Evan. This memorial page is dedicated for family, friends and future generations to celebrate the life of their loved one. Evan Michael Kraemer, age 24, earned his angel's wings with peace and dignity on January 29, 2019. Evan is the cherished son of Mindy A. (Moore) Kraemer and Cary J. Kraemer, and the brother of Justin. Evan will always be in the hearts of his grandparents, Joseph Andre and Donna Moore and Roger Kraemer, aunts and uncles Anita (Dale) Szyszkiewicz Becky (Cliff) Giese, Joseph Andre Moore Jr. (Kimberley), Dan (Jennifer) Moore, Melissa (John) Flaig, Ron (Kim) Kraemer and Karen Kraemer. Evan is further survived by cousins Sarah (Courtney) and David (Becky) Szyszkiewicz, Tom and Alex Giese, Nicholas and Hayden Moore, Samuel, William, and Andrew Flaig, Christopher Kraemer, and Jill Vorpahl. Evan will also be remembered by special friends Rhonda Fellenz, Jeri Williams, Brittany de Groot, Kayla Semple, Michelle Cramer, Nicci Andersen, Judy O'Hara, Bonnie Penkwitz, Lori Schultz, Travis Wick, his worldwide Kleefstra Syndrome family and his constant companion Bob the Builder. Evan was preceded in death by his grandmother Marlys (Opine) Kraemer. Evan has been a lifelong resident of Cedarburg, WI and is a 2014 graduate of Cedarburg High School. 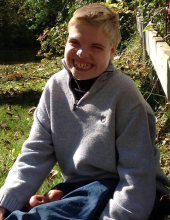 He enjoyed being a part of Best Buddies and the Pace program through Balance, Inc. E loved music. Barbara Ann, Happy Birthday, and Deck the Halls were his go to songs. He danced to Raffi, Katie Perry, Taylor Swift, Imagine Dragons, Frank Sinatra, Billy Bass, and every Christmas song he ever heard. Summerfest was one of his favorite events to attend. He also loved to travel, whether it was to visit his beloved cows while riding in the car or flying off to Boston to be with his Kleefstra Syndrome family, tour the city and watch the whales on an ocean cruise; or visit amusement parks in Texas and Florida. Evan was an avid movie watcher and especially loved Cats (The Musical), Rocket Gibralter, Annie Get Your Gun and The Sandlot. The Rugrats, Elmo, and, of course, Barney were very special to him. Evan loved to go for walks and especially loved to stop along Cedar Creek and watch the fishermen. He loved fish and fishing and was also a lover of the water...swimming pool, sink, waterfall, bathtub, ocean, lake, aquarium, creek, puddle or river .... it didn't matter. Evan loved the water. To send flowers or a remembrance gift to the family of Evan Michael Kraemer, please visit our Tribute Store. "Email Address" would like to share the life celebration of Evan Michael Kraemer. Click on the "link" to go to share a favorite memory or leave a condolence message for the family.